Originally, I wrote a six-pack post for today about how the Cubs’ system in going to change over the next 6-10 weeks. That post is going to have to wait for another day. Instead, Oscar de la Cruz is going to get some pub. 1. Oscar de la Cruz’s first two starts of 2018 could best be described as really, really bad. With an ERA of over 16, hitters were hitting .452 against him. The Cubs Director of Player Development prophetically expressed confidence in Oscar’s ability to adjust to being at AA Tennessee earlier in the week on Baseball America. 2. 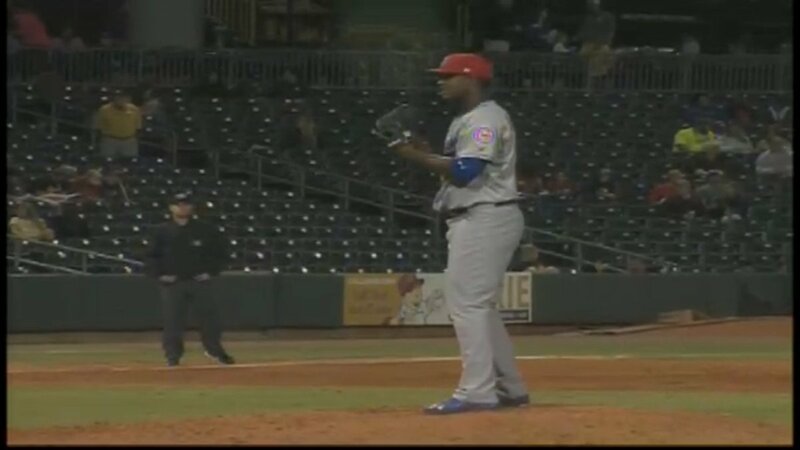 In his third start of the year for the Tennessee Smokies, Oscar got off to a bit of a rough start. Despite squaring up the ball solidly in the ball in the first, the Montgomery Biscuits were only able get a runner on via an error. Catcher Erick Castillo helped by throwing out that runner on an attempted steal. Even though Oscar only threw seven pitches in the inning, it was far from smooth as he lacked fastball command. 3. Oscar gave up a walk in the second, but he continued to throw mainly fastballs. The hard hit balls of the first inning began to disappear as he got his first strike out. He looked a little more comfortable the more pitches he threw. He was at 25 pitches through two innings. 4. The third and fourth innings were wonderful and he looked great as Oscar began to work in his curve the second time through the Biscuits’ order. He did give up a single in the third and then hit a guy in the fourth, but Oscar was looking very efficient on 55 pitches at that point. I did not get a lot of velocity readings but I did hear 92 a couple of times along with 93. 5. In the fifth, he threw 15 more pitches with 2 strikeouts as his curve looked beautiful in a nice 12-6 shape. Only facing three batters, he got them all out but each count began to go deeper. He was now at 70 pitches. I thought he might be done as a precaution. 6. I was wrong and I was glad I was wrong. de la Cruz came out in the 6th and used 12 pitches to get three quick outs. That inning saw Oscar attack the zone and his approach was very reminiscent of “2015 Oscar” when he was at Eugene and struck out 73 in 73 innings. He just attacked the zone and dared hitters to hit strikes. For the night, he went 6 IP with 6 Ks. He gave up one hit, walked one, and hit one. Overall, it was a pretty stress free night. What impressed me most was how much de la Cruz improved over the course of the game. The pitcher in the first was not the same pitcher in the sixth. Sixth inning Oscar de la Cruz was humming strikes down in the zone and rolling breaking balls off a table. He didn’t really throw his changeup much, but he did not need it. 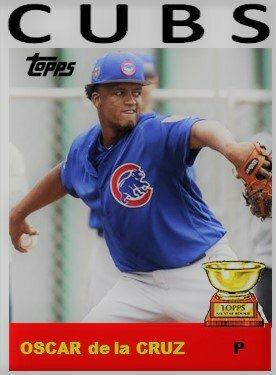 As a result, the former overall #1 prospect in the Cubs’ system dispelled any scuttlebutt that something was wrong with him or that he did not belong at AA. Now, he needs to build on his success from last night and continue to refine his fastball command and throw his changeup a bit more to make him a complete pitcher. It is going to be fun to watch.